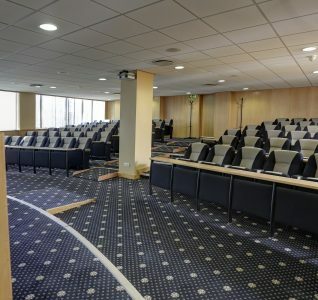 Conveniently located just outside the city centre (under a ten-minute drive away in fact), and with 115 complimentary parking spaces onsite, Holiday Inn Nottingham at Castle Marina is the perfect place to hold your next conference or business event. Its bedrooms have undergone a major refurbishment recently and we were invited along for a preview of the new facilities. The rooms on the ground floor have been refurbished to the highest standard, and work on the above floors’ bedrooms is due imminently meaning that in the not so distant future, all 128 of the bedrooms will be updated as well. The refurbished rooms have state of the art air-conditioning, which is a hybrid environmental friendly, water-based system – perfect during the hot summer months. The first room we were shown was an executive super king size room. It was modern, spacious and the perfect space to relax following a full-on day of conferencing. Although, having been redesigned as a contemporary room, there was still very much a welcoming feel to it. Nottingham-related photographs framed on the wall were the perfect homely touch and a nice tip of the hat to some of Nottingham’s finest examples of heritage and local heroes, as were the colourful pictures dotted along the corridor. The room had a comfy armchair, which was a nice touch as it meant the room had a separate area to unwind after a long day, and enjoy complimentary cup of tea and coffee, before you relax on a comfortable brand-new mattress. There’s also a smart desk area for those who wish to catch up on emails or perhaps Skype loved ones while they’re away. This is made all the more easier thanks to the hotel providing guests with 300mb of dedicated Wi-Fi. We were also shown a refurbished twin with double beds – a rarity for twin rooms. Again, while the room had a modern, unfussy finish, it still felt very much like a home from home – the 43” TV with plenty of Sky channels, super soft bed linen and anglepoise lamps can be thanked for this. In all but eight of the hotel’s new bathrooms (those bathrooms have bath tubs should guests specifically request one), large showers with high-quality ceramic shower trays can be found, along with fabulous Porcenalosa tiles and stylish Rubantia bins. 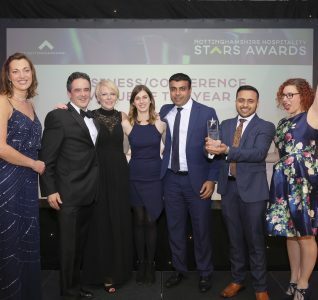 The hotel has two accessible rooms and one ambulant room, with large accessible bathrooms, so conference and event organisers can rest assured knowing that all their delegates can enjoy a comfortable stay following their event. The Holiday Inn Nottingham has it all when it comes to a conference venue and hotel – easy accessibility from the city centre and train station, free onsite parking, well-equipped conference spaces and facilities and 128 bedrooms, many of which have already been refurbished, offering super convenient and stylish accommodation for your delegates. 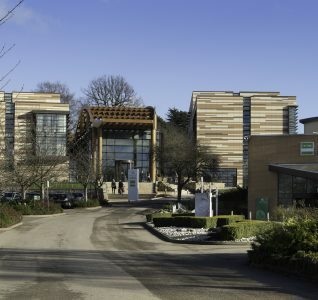 To find out more about Holiday Inn Nottingham Castle Marina please click here. If you have any questions about the venue or would like to check its availability please email our team. Feature written by Alex Broughton, Marketing & Communications at Visit Nottinghamshire.